The Hepworth Wakefield presents a major survey of work by British born artist Anthony McCall (b.1946). Solid Light Works is the first UK exhibition of McCall’s work in over a decade and includes the UK premiere of three new ‘solid light’ installations. Anthony McCall describes his practice as existing in the space where cinema, sculpture and drawing overlap. He is best known for his large-scale, immersive sculptural light installations that incorporate the visitor and invite them to become active participants in the work. The exhibition has been shaped closely with Anthony McCall and explores all facets of his work. It highlights how drawing has been an enduring and essential component of his practice. At the heart of the exhibition, two galleries are devoted to a survey of his graphic works. These rooms emphasize the importance of drawing for Anthony McCall, both as a way to imagine three-dimensional form and to explore temporal structure. For Anthony McCall, the circle, the straight line, and the wave are the basic elements that underpin his practice and each solid light work is a variation of these drawn shapes, often concealing, revealing or traveling through one another. The exhibition will demonstrate Anthony McCall’s meticulous planning of how a drawn line or shape will behave when rendered as though it were a physical three-dimensional structure. The drawings and notebooks will also show how Anthony McCall’s current work remains in active dialogue with his earliest ideas. Many of the works on paper connect directly to the three solid light installations in the exhibition. Harnessing the full capabilities of digital projection, Anthony McCall’s new installations are minimal in means, using only projected light and a thin mist, yet they create physically powerful works that take on the appearance of sculptural forms in space. These works are in a permanent state of flux, moving slowly through precisely mapped sequences that advance and return in repeating cycles over the course of the day. Visitors are encouraged to engage with the planes and chambers created by the projections which, at their expanded scale, take on almost architectural qualities. Leaving (with Two-Minute Silence) (2006/8). Pair of working drawings in a set of 24. Gelatin silver print, 156 cm x 114 cm. Anthony McCall began his career in the UK, making outdoor performances based on grids of small fires. 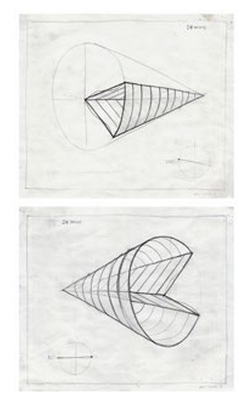 Shortly after moving to New York in 1973, he produced his first solid light work, the 16mm film Line Describing a Cone. Anthony McCall went on to produce a number of variations of this piece where, as the projected form unfolded, or swept through the darkened spaces, ambient dust and cigarette smoke created the illusion of volume. These works were related to the Expanded Cinema and Structural Film explorations of the London Filmmakers Cooperative. Line Describing a Cone will be restaged and shown in full at The Hepworth Wakefield over a special weekend of activity during the exhibition. Anthony McCall withdrew from his artistic practice at the end of the 1970s, establishing a successful graphic design studio that specialised in art publications. He reemerged in the 2000s, propelled by the development of the haze machine and of digital projection, that together enabled him to realise more ambitious concepts. Anthony McCall has attracted international recognition for his work, taking part in numerous important solo and group exhibitions at acclaimed institutions and his work is represented in collections worldwide.